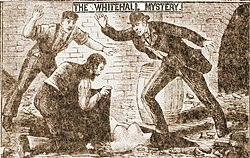 The Thames Torso Murders of 1887–1889, often called the Thames Mysteries or the Embankment Murders, was a series of unsolved murders that took place in London. The series included four incidents which were filed as belonging to the same series. None of the cases were solved, and only one of the four victims were identified. Speculations have linked the Thames murder series to that of the contemporary Jack the Ripper series. Between May and June 1887, the remains of a woman's body were found in the River Thames near Rainham. Workers first encountered a bundle with the torso of a female. Throughout May and June, various parts of the same body were found, with the exception of the head and upper chest. The investigation concluded that the body had not been dissected for medical purpose, but that a degree of medical knowledge had been necessary to perform the dissection. Because the doctors could not state a cause of death, the jury was forced to return a verdict of "Found Dead". Between 11 September and 2 October 1888, the dismembered remains of a woman were discovered at three different sites in the centre of the city, including the future site of Scotland Yard, the police's headquarters. The torso was matched by police surgeon Thomas Bond to a right arm and shoulder that had previously been discovered on the muddy shore of the River Thames in Pimlico on 11 September. The Times newspaper had initially suspected that the arm was placed in the water as a medical students' prank. On 4 June 1889 a female torso was found in the Thames, and more body parts were soon found in the Thames the next week. The London Times reported on 11 June that the remains found so far "are as follows: Tuesday, left leg and thigh off Battersea, lower part of the abdomen at Horsleydown; Thursday, the liver near Nine Elms, upper part of the body in Battersea Park, neck and shoulders off Battersea; Friday, right foot and part of leg at Wandsworth, left leg and foot at Limehouse; Saturday, left arm and hand at Bankside, buttocks and pelvis off Battersea, right thigh at Chelsea Embankment, yesterday, right arm and hand at Bankside." The investigation concluded that medical knowledge had been necessary to perform the dismemberment. At the inquest held by Mr Braxton Hicks on 17 June it was stated that: "the division of the parts showed skill and design: not, however, the anatomical skill of a surgeon, but the practical knowledge of a butcher or a knacker. There was a great similarity between the condition, as regarded cutting up, of the remains and that of those found at Rainham, and at the new police building on the Thames Embankment." The London Times of 5 June reported that "in the opinion of the doctors the women had been dead only 48 hours, and the body had been dissected somewhat roughly by a person who must have had some knowledge of the joints of the human body." She was about eight months pregnant. The doctors were also this time unable to establish a cause of death. The jury, however, reached the decision of "Wilful murder against some person or persons unknown". Though the head was never found, the victim was identified as Elizabeth Jackson, a homeless prostitute from Chelsea. On 10 September 1889 Police Constable William Pennett found the headless and legless torso of an unidentified woman under a railway arch at Pinchin Street, Whitechapel. It seems probable that the murder was committed elsewhere and that parts of the dismembered body were dispersed for disposal. Newspapers suggested a tie to Jack the Ripper's killings of prostitutes that were occurring simultaneously, but the Metropolitan Police said there was no connection. It is debatable whether Jack the Ripper and the "Torso killer" were the same person or separate serial killers active in the same area. The modus operandi of the Torso killer differed from that of the Ripper, and police at the time discounted any connection between the two. In his 2002 book The Thames Torso Murders of Victorian London, R. Michael Gordon suggests there may be a link to a murder in Paris in 1886, as well as to another murder in London in 1902. In November 1886, a woman's torso was found on the steps of the Montrouge church in Paris, missing the head, legs, right arm, left breast and uterus. In June 1902 a woman's torso was found in Salamanca Alley in Lambeth in London. No suspect was identified in either case. In the opening scenes of "The King Came Calling", the third episode of the first season of the television series Ripper Street, which takes place in 1889, Edmund Reid (Matthew Macfadyen) conducts an experiment to try and discover where Elizabeth Jackson's remains were dumped into the river; the ambiguity over Jackson's "provenance" leads to a dispute with Reid's opposite number in the City of London Police, who wants jurisdiction over the case. The 2013 novel Mayhem by Sarah Pinborough is based on the Thames Torso murders and includes newspaper articles from that time. Some of the characters are based on the people involved with the investigation. ^ a b Cullen 1965, p. 95. ^ Gordon 2015, p. 34. ^ "The Thames Mystery". Times [London, England]. The Times Digital Archive. 17 June 1889. p. 6. ^ "The Thames Mystery". Times [London, England]. 26 July 1889. p. 12 – via Times [London, England. ^ Evans & Rumbelow 2006, pp. 210–213. Cullen, Tom A. (1965). Autumn of Terror: Jack the Ripper: His Crimes and Times. [With plates.]. Bodley Head. Evans, Stewart P.; Rumbelow, Donald (2006). Jack the Ripper: Scotland Yard Investigates. Sutton. ISBN 9780750942287. Gordon, R. Michael (3 October 2015). The Thames Torso Murders of Victorian London. McFarland. ISBN 978-1-4766-1665-0. Skinner, Keith; Evans, Stewart (2013). The Ultimate Jack the Ripper Sourcebook. Little, Brown Book Group. ISBN 9781472107855. Bell, Neil R. A.; Bond, Trevor; Clarke, Kate; Oldridge, M.W. (15 July 2016). The A-Z of Victorian Crime. Amberley Publishing Limited. ISBN 978-1-4456-4787-6. Gordon, R. Michael (26 October 2009). The Poison Murders of Jack the Ripper: His Final Crimes, Trial and Execution. McFarland. ISBN 978-0-7864-5178-4. Stubley, Peter (1 September 2012). 1888: London Murders in the Year of the Ripper. History Press. ISBN 978-0-7524-8974-2. "The Thames Torso Murders of 1887-89", by Gerard Spicer, at Casebook.org.